I am so happy to tell you that our VBA Classes are now open for your consideration. Please read this short post to understand the benefits of this program & how to join us. Click here to join our classes, if you are ready. Clearly defined content: Learn VBA & Excel in simple, everyday language. Understand things by seeing several real-world examples we made for you. A-Z of everyday VBA: We did our best to create many everyday VBA examples, instructions & homework so that you will learn A-Z of everyday VBA. Pause, Stop & Repeat: All our lessons are pre-recorded, so you can watch them anywhere, pause them, stop or repeat at any time. Ask & Learn: Use our classroom website to ask doubts, get clarifications, download material & more. Less theory & rote, More practice & fun: We made this course with tons of practical examples, download workbooks & fun exercises so that you can learn better. If you have any doubts or questions about this program, please leave a comment & I will get back to you with answers. You can also reach me at chandoo.d @ gmail.com or call me at +91 814 262 1090 or +1 206 792 9480. I will be very glad to answer your questions. Thank you so much for your continued support to Chandoo.org. You are awesome, because you want to learn new things & improve. PS: If you are totally new to VBA, checkout our Introduction to VBA series. 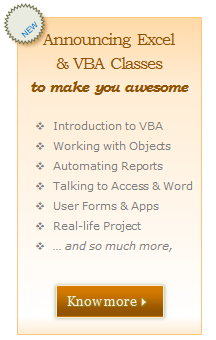 PPS: Join our VBA classes and see what magical things you can do. Click here. As soon as you join. All the material is already uploaded. Hi, Purna is there any different lesson as different from the previous batch. Are you able to offer a bundle price for the VBA and Project management course together? Sure. I will send an email with details to you. Chandoo..can i upgrade the membership after joining the classes...say I join in for the VBA online course...later if i want to upgrade to VBA download option..can I do that? Yes... you can. You can find the details about upgrading once you join us.